What follows is an edited version of Loconte’s remarks at the Evangelicals for Peace conference “Christians Engaging Global Conflict: Syria,” held on Nov. 16-17, 2016, in Washington, DC. When history renders its judgment of the conduct of the Western democracies toward the Syrian civil war, what will it be? And how will the conscience of the West—especially its Christian conscience—stand up under that judgment? Listen to historian C.V. Wedgwood: “Aggression, dynastic ambition, and fanaticism are all alike present in the hazy background behind the actual reality of the war.” Wedgwood was actually writing about the last religious war in the West, the Thirty Year’s War, which ended in 1648. Whatever meaning we attach to the Syrian conflict, we are witnessing once again the deadly interplay of political ambitions and sectarian zeal. The will to power under the cloak of religion. In the Thirty Year’s War, the Catholic League squared off against the Protestant Union. But that rivalry was overshadowed by the spectacle of the two great Catholic powers of Europe—France and Spain—battling it out like scorpions in a bottle. Out of the desolation of that conflict came not only the Treaty of Westphalia, with its respect for the territorial integrity of other nations, the idea of sovereignty. Thanks to Protestant thinkers such as Hugo Grotius, new principles were articulated for warfare: how to conduct wars, how to treat prisoners of war, and how to conclude wars with a semblance of justice. Though there may be circumstances, in which absolute justice will not condemn the sacrifice of lives in war, yet humanity will require that the greatest precaution should be used against involving the innocent in danger, except in cases of extreme urgency and utility. The human carnage of the Syrian civil war has been on display in ways we have not seen for decades. It was the remorseless violence of the 1990s—the genocide and the ethnic cleansings in Rwanda, in the Balkans, and in Sudan—which prompted the international community to think differently about its obligation to prevent crimes against humanity. Political leaders began to embrace a new concept in international relations: The Responsibility to Protect. As described in the UN’s “World Summit Outcome” document, approved by the General Assembly in September 2005, member states have a “collective responsibility to protect” people from genocide and other human rights abuses. The concept comes from a 2001 report by the International Commission on Intervention and State Sovereignty (ICISS). The commissioners argued that membership in the United Nations carries obligations: States that fail to protect their citizens, they said, should not be allowed to hide behind the doctrine of national sovereignty to escape international censure—or military action. “Where a population is suffering serious harm…the principle of non-intervention yields to the international responsibility to protect,” the commissioners wrote. The Responsibility to Protect expresses a universal norm, morally binding on all member states. What does any of this have to do with the Christian church? There are, after all, secular arguments for this principle of intervention. And none of the various UN documents supporting the Responsibility to Protect mention any religious sources for the new doctrine. Yet the philosophical fingerprints of the doctrine are unmistakable: The Responsibility to Protect owes its greatest debt to a religiously rooted approach to achieving peace with justice, the Christian just war tradition. Listen to Thomas Weiss, professor at the City University of New York, who led the Commission’s research team: “The principles are derived directly from the just war tradition,” he told me in an interview. The basic tenets of the Judeo-Christian moral vision were “front and center in the discussion” and provided the “intellectual underpinnings” of the rationale for intervention. The Christian just war tradition begins with the God-given worth and equality of every human life, and then insists on the state’s obligation to defend that life against harm—using lethal force if necessary. It draws both from the Hebrew Bible, from the Genesis account of man’s inherent dignity, as well as from the Christian New Testament, with its doctrine of a political authority empowered to restrain evil. Indeed, the UN’s criteria for military engagement—duplicated in nearly all successive UN documents—follow precisely those articulated by Christian theologians starting with Augustine: The motive must be to prevent human suffering (right intention); means short of force must be judged as unlikely to stop the aggressor (last resort); the military option must be proportional to the threat (proportionality); and the consequences of action must not be worse than inaction (reasonable prospects). This is classic Christian just war theory. If the Responsibility to Protect doctrine has gained international approval, then why is the international community still paralyzed in the face of this latest episode of crimes against humanity? First, there is the dismal example of Libya. During the uprising against Muamar Gaddafi, the UN Security Council invoked the “responsibility to protect” to intervene. The regime was toppled, and Libya quickly descended into chaos. The failure of the United States and our European allies to help stabilize Libya has discredited the doctrine among many political leaders and leaders in humanitarian organizations. Second, there is a widespread belief that any conflict in the Middle East is fueled by religious ideology, and that Western intervention will only make the situation worse. Radical Islam will use the presence of Western military forces as a recruiting tool. Third, there has been a complete lack of imagination by the Obama administration about how to address the Syrian conflict and protect civilians. There is no moral vision for the United States in this epic crisis. To hear President Obama tell it, we should congratulate the White House for its prudence and geo-political humility with regards to Syria: No American soldiers, after all, have died in this war. But Mr. Obama has much less to say about the 470,000 Syrians who have perished violently because of Assad’s determination to remain in power, or the fact that half of the population of Syria have become refugees. As the president’s chief foreign policy advisor, Ben Rhodes, put it to a group of Syrian activists: “Nothing we could have done would have made things better.” Let that sentence hang in the air: Nothing we could have done would have made things better. Here is fatalism masquerading as foreign policy. Fourth and finally, most decision-makers remain slavishly devoted to the United Nations—especially the UN Security Council—as the only legitimate institution to confront human rights crises. But one of the principles of just war thinking is the need for a legitimate political authority. The 15-nation UN Security Council is a mix of democracies and dictatorships. It grants veto power to autocratic regimes that, by definition, have little regard for the rights of the weak. Russia, for example, a permanent member of the Security Council, is the strongest supporter of the Assad regime—the government that is primarily responsible for the bloodletting. James Turner Johnson, a leading just war theorist, observes that the United Nations has a history of paralysis in this regard. “The structure of the UN is such,” he writes, “that clear purpose and effective command and control are virtually unimaginable.” These are geo-political realities. Misplaced faith in the UN system to protect civilian populations owes much to secular assumptions about human nature and political societies. The Syrian civil war has been deepened by the liberal notion that diplomatic talk can solve virtually any crisis—exemplified by Secretary of State Kerry’s feckless peace agreements, which have only strengthened the hand of Bashar al-Assad, not to mention the insidious influence of Putin’s Russia. [Liberalism] is full of illusions about the character of human nature, particularly collective human behavior. It imagines that there is no conflict of interest which cannot be adjudicated. It does not understand what it means to meet a resolute foe who is intent upon either your annihilation or enslavement. We need a dose of Niebuhr’s Christian realism. We have heard repeatedly the mantra that “there is no military solution to this crisis.” Behind this slogan lies a utopian impulse: the desire to make the ethics of the Sermon on the Mount—love your neighbor as yourself—a road map for U.S. foreign policy. This represents a profound intellectual confusion: the conflation of the nature and responsibilities of the State with the nature and responsibilities of the Church. Of course the work of the Christian church, of Christian relief organizations, is critical to helping people in great humanitarian need. This is the task of civil society. Christian humanitarian work is the mirror image of the Responsibility to Protect: believers, operating with their resources of love and compassion and mercy, reach out to help their neighbors in need. But this work, as important as it is, may not advance the cause of justice. That is primarily the role of the State: to punish the aggressor and protect the innocent from great harm. This “theology of love,” as they call it, offers no effective protection to the neighbor in need—whether they are the Jews at Auschwitz or the Christians in Kirkuk or the Muslims in Aleppo. 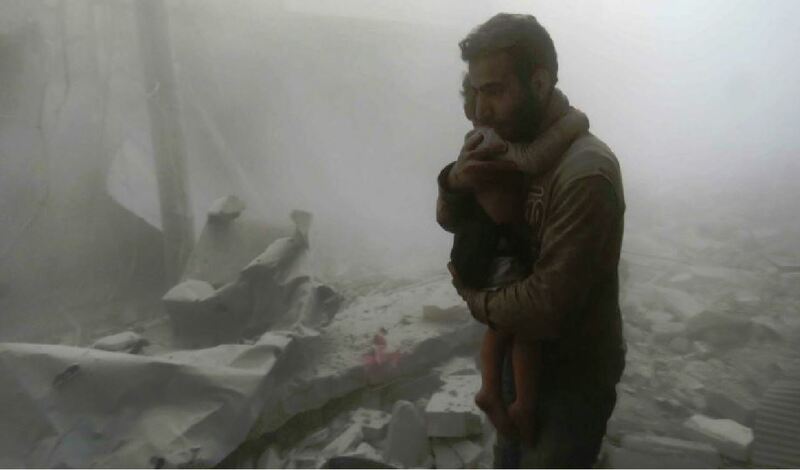 As the Somali poet, Warsan Shire, explains: “No one puts their children in a boat unless the water is safer than the land.” Today, five years into the civil war, there is no safety for millions of men, women, and children in the land of Syria. How will history judge the West in light of this catastrophe? But we cannot consider the abandonment and ruin of Czechoslovakia in the light only of what happened…last month. It is the most grievous consequence…of what we have done and of what we have left undone in the last five years—five years of futile good intention, five years of eager search for the line of least resistance, five years of uninterrupted retreat of British power…Those are the features which I stand here to declare and which marked an improvident stewardship for which Great Britain and France have dearly to pay. To borrow from Churchill, “we are in the presence of a disaster of the first magnitude.” No, a “theology of love” divorced from the Biblical demands of justice will not do. What should we call this theology—this ideology that allows the forces of terror to triumph, this pietism that adds to the catalogue of human suffering? Here, it seems, is a distortion of the heart of the gospel message, the Christian doctrine of the atonement. As Niebuhr explained, “the divine mercy, apprehended by Christian faith in the life and death of Christ, is not some simple kindness indifferent to good and evil.” Any political attempt to bring about a more just society, he said, must face the intractable nature of human sin. The Biblical answer to the problem of evil in human history is a radical answer, precisely because human evil is recognized as a much more stubborn fact than is realized in some modern versions of the Christian faith. These versions do not take the problem of justice in history seriously, because they have obscured what the Bible has to say about the relation of justice to mercy in the very heart of God. Radical evil demands the radical answer of the gospel: Mercy and Justice. Love and Truth. The Lamb of God and the Lion of the Tribe of Judah. Here is good news, a gospel worthy of the name. Whatever else we do, or attempt to do: may we help our neighbors in Syria come to know this gospel, and to know a measure of the peace that comes with this knowledge—not peace as the world gives, but the peace that endures. Photo Credit: After airstrikes and rocket attacks in Aleppo on November 16, according to Syria Civil Defense. By Fardous and posted by The White Helmets (@SyriaCivilDef), via Twitter. “2005 World Summit Outcome,” United Nations General Assembly, September 15, 2005. “The Responsibility to Protect,” Report of the International Commission on Intervention and State Sovereignty, December 2001. “A More Secure World: Our Shared Responsibility,” Report of the Secretary-General’s High-Level Panel on Threats, Challenges and Change” (United Nations, 2004), pp. 65-7. “In Larger Freedom: Towards Development, Security and Human Rights for All,” Report of the Secretary-General, March 21, 2005, Fifty-ninth Session, United Nations General Assembly, p. 35. “The Responsibility to Protect,” Report of the International Commission on Intervention and State Sovereignty, December 2001, xii. James Turner Johnson, “Humanitarian Intervention After Iraq: Just War and International Law Perspectives,” Journal of Military Ethics, vol. 5, no. 2 (2006), pp. 114-27. Reinhold Niebuhr, Christianity and Power Politics (Charles Scribner’s Sons, 1940), p. 68. Reinhold Niebuhr, “Christian Faith and the World Crisis,” Christianity and Crisis, February 10, 1941.